As the child of a Jewish father and a Catholic mother who converted to Judaism, Rabbi Sarah Bassin developed a deep interest in interfaith relations. During rabbinical school, that interest translated into an internship in Jewish-Muslim relations. “I felt that the conversation between those communities had never really started,” she said. Meanwhile, Edina Lekovic grew up in a culturally Muslim home, had Jewish friends in high school, but was troubled by interactions between Muslims and Jews in college. “At UCLA, I felt tension with the Jewish community, and later watched as the Muslim-Jewish relationship was largely defined by overseas conflict rather than local shared interests,” said Lekovic, who is now director of policy and programming for the Muslim Public Affairs Council in Los Angeles. Today, Bassin, Lekovic, and a growing number of others in the Muslim and Jewish communities are enlightening each other and working together through NewGround, an organization that fosters healthy dialogue and social change between the two groups. Bassin serves as the organization’s executive director and Lekovic is chair of the board. Founded in 2006, New Ground has developed innovative programs embraced by both communities. Its work has flourished and expanded under the fiscal sponsorship of Community Partners. NewGround’s core program is the Emerging Leaders Fellowship. 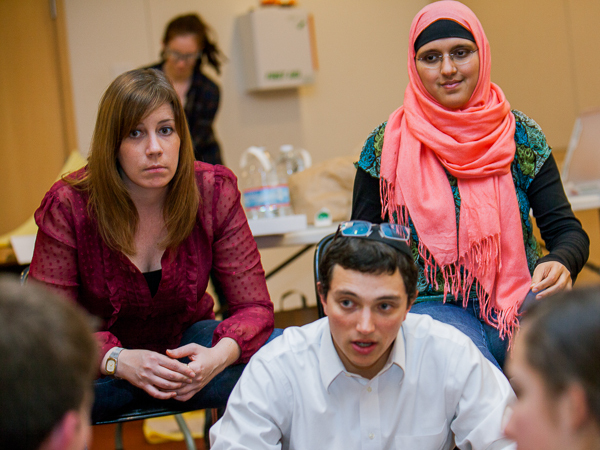 Each year, a diverse group of 20 Muslim and Jewish young professionals learn conflict-resolution skills and how to apply them to discussions about Israeli-Palestinian relations, anti-Semitism, Islamophobia, and more. New Ground engages high-school students through its MAJIC program (Muslims and Jews Inspiring Change) and was named by the Office of the Governor of California as "California's 2013 Faith-based Organization of the Year. "Another recognition of the organization’s expanding role and impact was an invitation to last year’s White House Hanukah celebration.